Recorded as Heck, Hecks, Heak, Heake, the diminutives Heackle, Heckel, Heckle, Heakin, Heckin, the patronymics Heackles, Heckles, Heakins, Heckins, and the prejoritives Heaker, Heeker, and possibly others this interesting surname is medieval English. It may have at least two origions. The first is locational either from a place called Heck near Selby, in the former West Riding of Yorkshire, or possibly Heckmondwike in the same county, or according to the famous International Genealogical Index, it is from Eccles, a town in Lancashire. We have considerable doubt about that theory. The placename is first recorded as "Hecca" in the Early Yorkshire Charters list of 1157, and as "Heck" in the tax rolls known as the 'Feet of Fines' in 1216, it probably derives from the Olde English pre 7th century word "haecc", meaning a gate, and sometimes a floodgate or sluice-gate. Another possible origin is occupational, and described a "hecker or hacker". This was a man employed to keep waterways, weirs and sluices clear of weed and other rubbish. One of the earliest examples of the surname recording is that of John de Hecke in the Book of Fees of Yorkshire in 1242. Later recordings taken from surviving church registers from Tudor times onwards include: the marriage of Marie Heck and Edward Barkham on January 18th 1635, at Tottenham, and that of Robert Heakle at the chuirch of St Martin-Vintry in the city of London, on January 17th 1637. 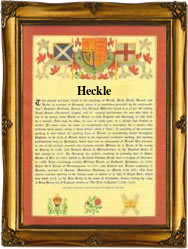 The first recorded spelling of the family name is shown to be that of John del Hek. This was dated 1219, in the Assize Court Rolls of Yorkshire, during the reign of King Henry 111rd of England, 1216 - 1272. Throughout the centuries, surnames in every country have continued to "develop" often leading to astonishing variants of the original spelling.